In the presented studies p53 and bcl-2 proteins expression were evaluated in samples of gastric carcinomas in patients with Helicobacter pylori or EBV or without H. pylori/EBV infection. The studies were conducted on 64 adult patients with gastric adenocarcinomas: 16 patients with H. pylori (cagA+)-positivity (group 1), 14 with EBV-positive tumours (group 2), 12 with H. pylori/EBV-positive tumours (group 3) and 22 patients with H. pylori/EBV-negative tumours (group 4). H. pylori presence in gastric tumour specimens was detected using Giemsa staining and bacterial culture technique. Moreover, cagA gene was detected using PCR. EBV infection was detected based on EBER presence in the tissue by RNA in situ hybridization. 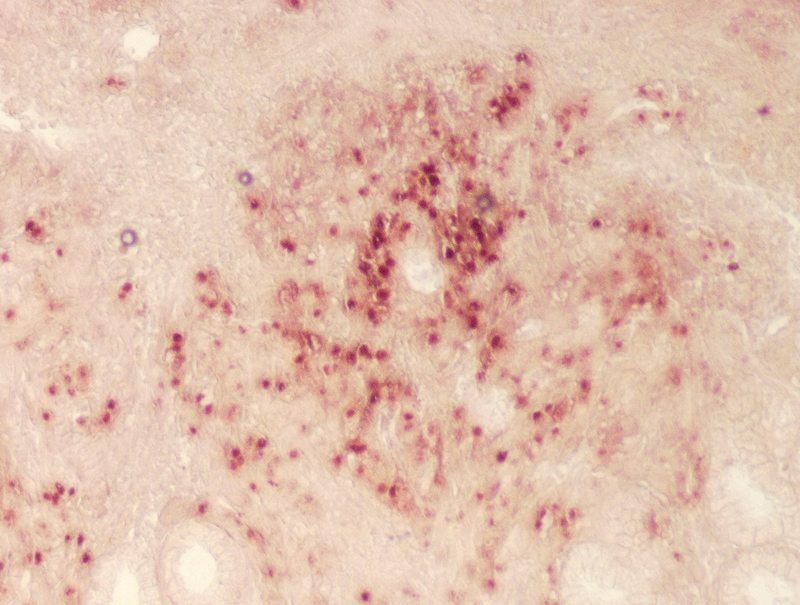 Expressions of p53 and bcl-2 proteins were analysed using immunohistochemistry. Expression of p53 was noted in 14 (84%) patients from group 1, 8 (57%) patients from group 2, 7 (58%) patients from group 3, and 19 (86%) patients from group 4, whereas expression of bcl-2 was noted in 12 (75%) patients from group 1, in 10 (71%) patients from group 2, 9 (75%) patients from group 3, and 6 (27%) patients from group 4. The obtained results allow the conclusion, that H. pylori (cagA+)-associated development of the gastric adenocarcinoma is determined by abnormalities in the p53 protein function and overexpression of anti-apoptotic bcl-2 protein, whereas EBV-associated adenocarcinomas seem to be related with apoptosis resistance associated with bcl-2 overexpression. It has been well documented that pathogenesis ofthe gastric cancer is a complex and multi-stage process, with progression in lesions of the mucous membrane from chronic gastritis to chronic atrophic gastritis, intestinal metaplasia, dysplasia and finally gastric car­cinoma (Konturek et al., 2003; Carcas, 2014). A signifi­cant role of infection with Helicobacter pylori (H. pylori) in the carcinogenesis process was also well established, defining this bacterium as a class I carcinogen forgastric cancer (IARC, 1994). Moreover, involvement of infection with the Epstein-Barr virus (EBV) in etiopathogenesis of gastric cancer was also documented(Czopek et al., 2003; Iizasa et al., 2012; Chen et al., 2012). It is estimated that gastric carcinomas are in approximately 80% cases associated with H. pylori infec­tion, whereas in approximately 10% they are associated with EBV infection (Wu et al., 2000; HCCG, 2001; Czopek et al., 2003; Palli et al., 2007). In 40 to 100% of H. pylori strains isolated from patients with gastric carcinomas the cagA (cytotoxin-associated gene A) (Palli et al., 2007) was detected. Crucial role in the car­cinogenesis process is played by p53 protein (tumour protein p53) and bcl-2 protein (B-cell leukemia/lym­phoma-2) (Ozaki and Nakagawara, 2011; Moldoveanu et al., 2014; Czabotar et al., 2014). p53 has a suppres­sive effect on the cancerous transformation through induction of apoptosis in cells with defected genome (Vermeulen et al., 2003). As for bcl-2, it is the strong­est apoptosis inhibitor among all known cell proteins (Mérino and Bouillet, 2009). Nevertheless, it remains unclear whether in gastric carcinoma p53 abnormali­ties and bcl-2 expression are dependent on presence of H. pylori or EBV infection. Therefore, in this study we investigated p53 and bcl-2 expression in gastric carcinomas in patients with H. pylori/EBV or withoutH. pylori/EBV infection. Patients. The studies were conducted on 64 adult patients with histologically confirmed diagnosis of gas­tric adenocarcinoma. From patients who underwent routine upper endoscopy antral biopsies were taken. Cancer diagnosis (adenocarcinoma) was verified by analysis of hematoxylin and eosin stained prepara­tions (Shibata et al., 2001; Matsubara et al., 2004). Based on presence of infection with H. pylori or EBV, three study groups were distinguished. Group 1 included 16 H. pylori-positive patients (10 males and 6 females), 59 ± 12.4 years of age. The second group consisted of 14 EBV-positive patients (10 males and 4 females), 61 ± 6.7 years of age. The third group involved 12 H. pylori-positive and EBV-positive patients (9 males and 3 females), 62 ± 8.3 years of age. The fourth group included 22 H. pylori-negative and EBV-negative patients (17 males and 5 females), 65 ± 7.5 years of age. H. pylori and cagA gene detection. Biopsies of gastric mucosa were plated on Columbia agar (bio-Merieux) with 7% sheep blood with antibiotic supple­ment (Helicobacter pylori Selective Supplement (Dent), Oxoid). The incubation was conducted in microaero­philic conditions (Genbox microaer, bioMerieux) for 4 to 6 days at the temperature of 37°C. The isolated H. pylori strains were identified based on Gram stain­ing as well as by production of urease, catalase, and oxidase (Szkaradkiewicz et al., 2010). For detection of cagA gene, the diagnostic kit of PCR-H. pylori (DNA Gdańsk) was used. PCR product was subjected to elec­trophoresis in the 2% agar gel and the result was read after staining with ethidium bromide. Presence of PCR reaction in form of a product of 445 base pairs in size was accepted as the positive test result. Moreover, pres­ence of H. pylori was identified in the tissue sections using Giemsa staining (Lee and Kim, 2015). Detection of EBER (EBER 1 and EBER 2) in tissue material. EBV DNA product in the form of untrans­lated RNA (EBER 1 and EBER 2) particles was detected in tissue material using in situ hybridization (ISH) (Nie­dobitek and Herbst, 2006; Izadi and Taheri, 2010). The tissue material was fixed in formalin and embedded in paraffin. Five μm thick sections were deparaffinised and digested with proteinase K for 30 min at 37°C, and washed in DEPC. This was followed by inactivation of proteinase K in 0.4% PFD solution for 20 min at 4°C. The hybridisation was performed using a fluorescein-labelled RNA probe of 15 nucleotides in length (PNA Probe/FITC; DakoCytomation) for 15 h at 37°C. After a thorough washing in SWS solution (DakoCytoma­tion) the product was detected using FITC/AP-specific antibodies. BCIP/NBT (PNA ISH Detection kit; Dako­Cytomation) was used as a substrate. 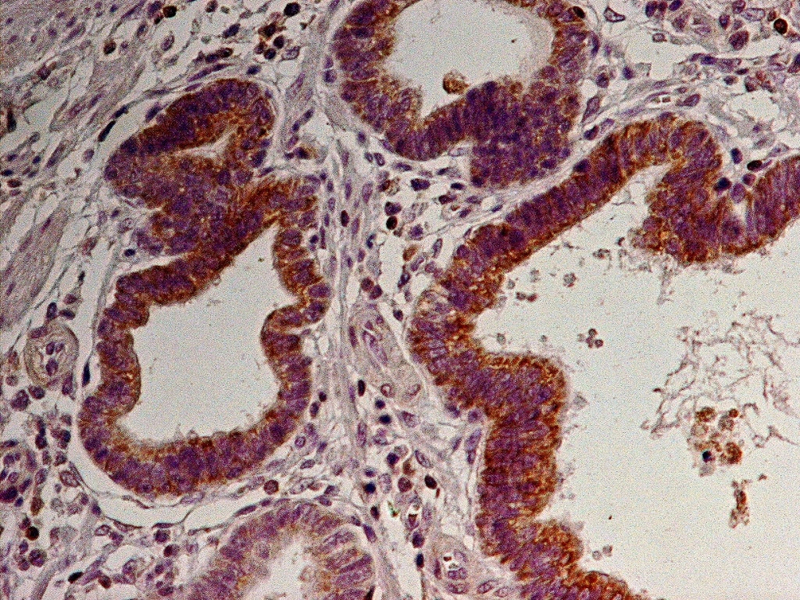 Immunohistochemical analysis of TP53 protein (p53). Five μm thick sections from the same tumour blocks, used for EBER detection, were immunohisto­chemically analysed for the presence of p53 protein. Following removal of paraffin, rehydration and block­ing of endogenous peroxidase activity with 3% H2O2 in distilled water, the tissue was incubated in 10 mM citrate buffer (pH 6.0) in a microwave oven (1000 W) for 15 min. Subsequently, the tissue was rinsed with phosphate-buffered saline (PBS) and treated with the primary antibody, DO-7 mouse anti-human p53 protein (DakoCytomation) in 1:50 dilution, employing 30 min incubation at room temperature. For visualisation of the reaction EnVision+ System-HRP (horseradish peroxi­dase) kit (DakoCytomation) was used. PBS was substi­tuted for primary antibodies as the negative control. Asa positive control, a section of colorectal cancer with highp53 expression was used. In all slides the cells stained per 1000 carcinoma cells were scored. The section was considered p53 positive when at least 10% cell nuclei were stained (Nasierowska-Guttmejer et al., 2000). 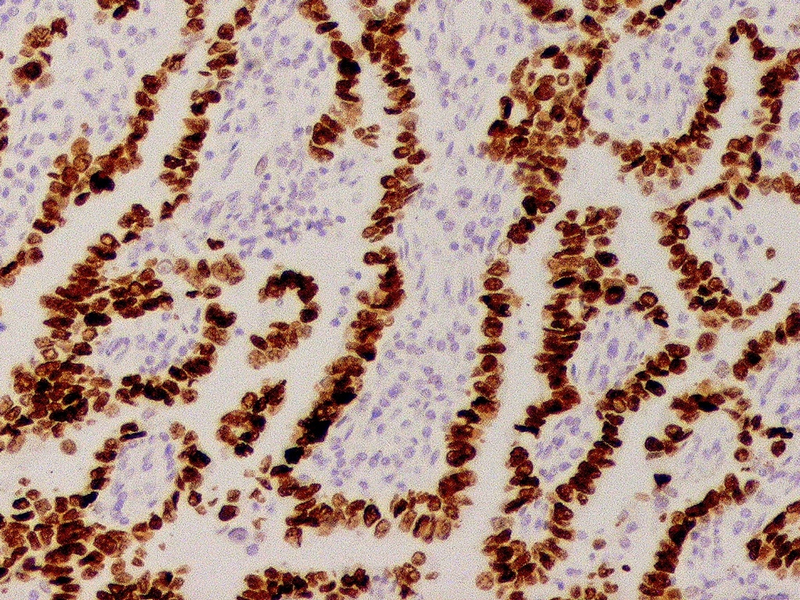 Immunohistochemical analysis of bcl-2 protein. Five μm thick sections from the same tumour blocks were immunohistochemically analysed for the presence of bcl-2 protein. Following removal of paraffin, rehy­dration and blocking of endogenous peroxidase activity with 3% H2O2 in distilled water, the tissue was incu­bated in 10 mM citrate buffer (pH 6.0) in a microwave oven (1000 W) for 15 min. Subsequently, the tissue was rinsed with phosphate-buffered saline (PBS) and treated with the primary antibody, FLEX monoclonal mouse anti-human bcl-2 oncoprotein (DakoCytoma­tion) in 1:50 dilution, employing 30 min incubation at room temperature. For visualisation of the reaction EnVision+ System-HRP kit (DakoCytomation) was used. Finally, the site of immunoprecipitate formation was detected by applying diaminobenzidine (DAB; Sigma). PBS was substituted for primary antibodies as the negative control. 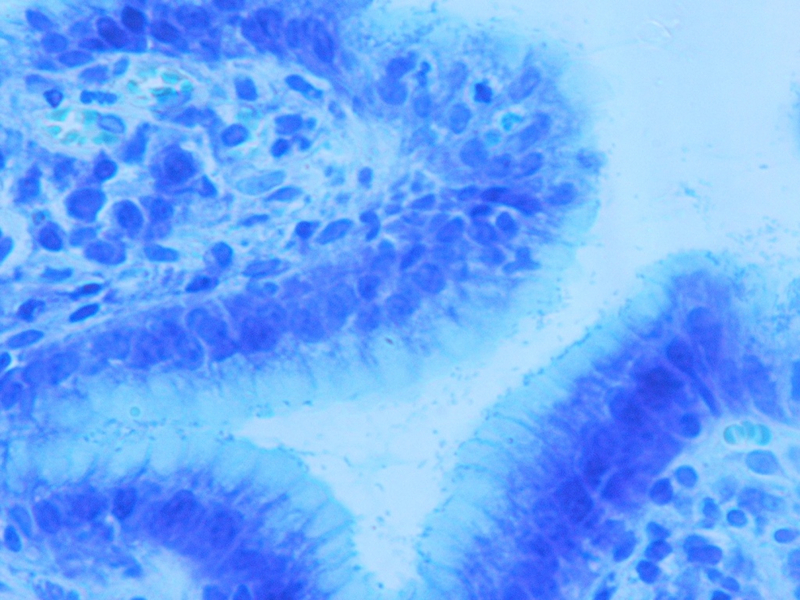 As a positive control, a section of colorectal cancer with high bcl-2 expression was used. In all slides the cells stained per 1000 carcinoma cells were scored. The section was considered bcl-2 posi-tive when at least 10% cell cytoplasms were stained (Nasierowska-Guttmejer, 2001). Statistical analysis. Differences in frequencies of p53 and bcl-2 positive results were compared with Fisher’s exact test. Relationships with P-values higher than 0.05 were considered insignificant. H. pylori and EBV infection. Among studied patients with gastric carcinoma, were 16 (25%) patients with H. pylori infection constituted group 1 (Fig. 1), in which presence of cagA gene was detected in 14 isolated strains of the bacteria. Group 2 included 14 (22%) patients proved to be EBV-positive (Fig. 2). Group 3 included 12 (19%) patients found to be H. pylori-pos­itive and EBV-positive. Group 4 included 22 (34%) patients in whom neither EBV infection nor H. pylori infection could be detected. Expression of p53 protein. Results of detection of p53 protein are summarized in Table I. In group 1, among 16 patients with H. pylori-associated gastric carcinoma nuclear expression of p53 in most tumour cells was demonstrated in 14 (87%) cases (Fig. 3). In the remaining 2 (13%) cases no p53 could be detected. In group 2, among 14 patients with EBV-associated gastric carcinoma in 8 (57%) cases nuclear expression of p53 protein was noted in most tumour cells. In the remain­ing 6 (43%) cases no p53 could be detected. In group 3, among 12 patients with H. pylori-positive and EBV-positive gastric carcinoma in 7 (58%) cases nuclear expression of p53 protein was noted in most tumour cells. In the remaining 5 (42%) cases no p53 could be detected. In the group 4, among 22 patients with EBV-negative and H. pylori-negative gastric carcinoma, p53 protein nuclear expression was noted in most tumour cells in 19 (86%) cases. No p53 was detected in the remaining 3 (14%) cases. Expression of p53 in indi­vidual groups of patients, 1 to 3, with H. pylori and/or EBV infection, was not significantly more frequent than in patients without these infections (P = 1.0000, P = 0.1111 and P = 0.0975, respectively). Fig. 1. H. pylori-positive gastric adenocarcinoma. Fig. 2. EBER-positive gastric adenocarcinoma. Fig. 3. Expression of p53 in H. pylori (cagA+)-positive gastric adenocarcinoma. with EBV or H. pylori. * significantly different as compared to group 4. Expression of bcl-2 protein. Results of detection of bcl-2 protein are summarized in Table I. In group 1, among 16 patients with H. pylori-associated gastric carcinoma expression of bcl-2 was demonstrated in most tumour cells in 12 (75%) cases (Fig. 4). In the remaining 4 (25%) cases no bcl-2 could be detected. In group 2, among 14 patients with EBV-associated gas­tric carcinoma in 10 (71%) cases expression of bcl-2 protein was noted in most tumour cells. In the remain­ing 4 (29%) cases no bcl-2 could be detected. In the group 3, among 12 patients with H. pylori-positive and EBV-positive gastric carcinoma, bcl-2 protein expres­sion was noted in most tumour cells in 9 (75%) cases. No bcl-2 was detected in the remaining 3 (25%) cases. In the group 4, among 22 patients with EBV-negative and H. pylori-negative gastric carcinoma, bcl-2 protein expression was noted in most tumour cells in 6 (27%) cases. No bcl-2 was detected in the remaining 16 (73%) cases. Expression of bcl-2 was found to be more fre­quent in the group of patients with H. pylori infection (P = 0.0036), the group of EBV-associated gastric carci­noma patients (P = 0.0159) and the group of H. pylori-positive and EBV- positive gastric carcinoma patients (P = 0.0120) but no difference in the frequency could be demonstrated in the groups of patients with EBV-negative and H. pylori-negative gastric carcinoma. In the present study, expressions of p53 and bcl-2 proteins have been examined in H. pylori- and/or EBV-associated and H. pylori/EBV-negative gastric carcino­mas. Presence of H. pylori in the isolated samples of gastric tumour has been directly detected using Giemsa staining method of histological sections (Lee and Kim, 2015), and the bacterial culture from the obtained sam­ples. In turn, infection with EBV has been detected on the basis of EBER presence in tumour cells. It has already been well documented that EBER is expressed in all forms of EBV latency and can always be detected by in situ hybridization (Murray and Young, 2002; Iizasa et al., 2012; Chen et al., 2012). Thus, the tech­niques employed in this study provided a reliable and a highly specific diagnosis of H. pylori/EBV infection. The obtained results have shown that in most cases of both H. pylori (cagA+)-positive (group 1) and H. pylori-negative gastric carcinomas (group 4) a dis­turbed function of p53 gene is observed. The data may suggest that H. pylori (cagA+) is not responsible for development of mutation in p53 gene and the dem­onstrated overexpression of p53 in cancerous tissues. The suggestions are supported by results of earlier studies conducted by Berloco et al. (2003) and Targa et al. (2007). On the other hand, however, Suriani et al. (2008) demonstrated H. pylori CagA-specific antibodies in sera of 82.6% patients with H. pylori-negative gastric cancer. This indicates that patients with gastric carci­noma, even if H. pylori-negative at the time of this test­ing, might have been infected by H. pylori before onset of the disease and in the meantime the pathogen under­went eradication. Taking the above into account, it is possible that at least a proportion of group 4 patients have earlier been infected with H. pylori (cagA+). In addition, the percentage of patients manifesting expres­sion of p53 in group 1 as well as in group 4 was high while results of p53 expression in all examined groups manifested no significant differences. In such a context it seems probable that H. pylori (cagA+) may induce p53 mutations already at the early phase of carcinogenesis. The conclusion seems to be supported by studies of Kuniyasu et al. (2000) and of Kountouras et al. (2008) who detected p53 mutations in at least 30% cases of intestinal metaplasia and in 58% patients with gastric dysplasia. Moreover, recent data indicate that infec­tion with H. pylori may lead to an increased expres­sion of p53 apoptosis inhibitor (iASP), mediating the anti-apoptotic process (Meng et al., 2013). Thus, the pathogen may induce mutations of p53 gene, and also its deregulation, which results in promotion of gastric cell proliferation and cancerous transformation. However, proportions of patients with p53 expres­sion were lower in the analysed groups 2 and 3. Thus, the obtained results may suggest that abnormalities in p53 gene in gastric cancer are not EBV-dependent, consistent with results of our earlier study (Szkaradkiewicz et al., 2006). Such a suggestion is supported by other studies indicating that p53 gene mutations are seldom identified or are absent from EBV-associated neoplasias (Petit et al., 2001; Wang et al., 2005). In addition, expression of p53 has been observed more frequently in group 4 than in groups 2 and 3. The obser­vation corresponds to the earlier published studies of Ishii et al. (2004). The authors showed that frequency of p53 overexpression was lower in EBV-positive than in EBV-negative early stage gastric adenocarcinomas. Thus, the data might suggest that EBV interacts with p53 gene, preventing or reducing expression of p53. In such a context, the suggestion that EBV infection promotes the development of gastric cancer by a p53 pathway-dependent mechanism seems doubtful. In turn, in analysis of our results devoted to bcl-2, we have documented expression of the anti-apoptotic protein in most cases of H. pylori (cagA+)-positive gastric carcinomas (group 1). In parallel, frequency of bcl-2 expression has been higher in patients of groups 1–3 than in patients of group 4. Therefore, it can be concluded that chronically developing infection with H. pylori (cagA+) determines an increase in bcl-2 expression, which in turn promotes development of gastric cancer. The conclusion finds support in earlier publications (Konturek et al., 2003; Lima et al., 2008). Moreover, Bartchewsky et al. (2010) demonstrated that in H. pylori infection, manifested by chronic gas­tritis, an increased Bax expression initiates cell apop­tosis, but in patients with gastric cancer the pathogen induces the anti-apoptotic gene bcl-2. In addition, the presented in vitro investigations demonstrate that the H. pylori-secreted vacuolating cytotoxin – VacA exerts a pro-apoptotic effect on epithelial cells, acting in an opposite manner to anti-apoptotic activity of CagA (Oldani et al., 2009; Matsumoto et al., 2011). There­fore, the early period of infection with H. pylori, due to action of VacA, develops with overexpression of the pro-apoptotic protein while translocation of CagA to epithelial cells mobilizes overexpression of bcl-2 and, as a result, assures cellular survival. Recently presented data indicate also that CagA may activate human epi­dermal growth factor receptor 2 (HER2) in gastric cells (Shim et al., 2014). Activation of the oncogene plays an important role in cell proliferation and tumorigenesis (Gravalos and Jimeno, 2008; Bollig-Fischer et al., 2010). In turn, results presented in this study, related to bcl-2 in patients carrying only EBV-positive (group 2) versus EBV-negative gastric carcinomas (group 4) have demonstrated significant differences in expression of the protein between the two groups. The results con­tradict studies of Ishii et al. (2001) and Lima et al. (2008) but are consistent with earlier results of Kume et al. (1999), who documented high bcl-2 expres-sion in EBV-positive gastric carcinomas. The obtained by us data allow to conclude that EBV-infection induces bcl-2 expression in gastric epithelial cells. It is already well known that EBV latent membrane protein (LMP)-1 inhibits cell apoptosis, elevating levels of bcl-2(Zimber-Strobl et al., 1996; Thompson and Kurzrock, 2004). Nevertheless, investigations on EBV gene expres­sion in gastric carcinomas documented type I latency pattern, that used to be restricted to EBV nuclear anti­gen (EBNA)-1, the EBERs, and secretion of BARF0 gene proteins (Thompson and Kurzrock, 2004; Sivachandran et al., 2012). At the same time, until now no reports have appeared which would document upregulation of bcl-2 – associated with EBNA-1 and BARF0 in epithe­lial cell lines (Fu et al., 2013). Nevertheless, EBERs may induce up-regulation of bcl-2 in immortalized naso­pharyngeal epithelial cells, causing their tumorgenesis (Wong et al., 2005). Moreover, it is demonstrated that BARF0 may stimulate expression of HER2 in epithelial cells, which may point to involvement of still another molecular mechanism in pathogenesis of EBV-infected gastric carcinoma cells (Lin et al., 2007). Such data, in the context of results presented by us seem to indicate that also the development of EBV-associated gastric car­cinomas is dependent on bcl-2 anti-apoptosis activity. In conclusion, our current studies indicate that the development of H. pylori (cagA+)- positive gastric adenocarcinomas is linked to abnormalities in func­tion of p53 protein and the overexpression of anti-apoptotic bcl-2. On the other hand, the development of EBV-positive gastric adenocarcinomas seems to be related with apoptosis resistance associated with bcl-2 overexpression. The research was supported by a grant from Poznań University of Medical Sciences, Poland (502-01-02206316-02658). Bartchewsky W.Jr., M.R. Martini, A.C. Squassoni, M.C. Alvarez, M.S. Ladeira, D.M. Salvatore, M.A. Trevisan, J.Jr. Pedrazzoli and M.L. Ribeiro. 2010. Effects of Helicobacter pylori infection on the expressions of Bax and Bcl-2 in patients with chronic gastritis and gastric cancer. Dig. Dis. Sci. 55(1): 111–116. Berloco P., F. Russo, F. Cariola, M. Gentile, P. Giorgio, M.L. Caruso, A.M. Valentini, G. Di Matteo and A. Di Leo. 2003. Low presence of p53 abnormalities in H. pylori-infected gastric mucosa and in gastric adenocarcinoma. J. Gastroenterol. 38(1): 28–36. Bollig-Fischer A., M. Dziubinski, A. Boyer, R. Haddad, C.N.Giroux and S.P. Ethier. 2010. HER-2 signaling, acquisition of growth factor independence, and regulation of biological networks associated with cell transformation. Cancer Res. 70(20): 7862–7873. Carcas LP. 2014. Gastric cancer review. J. Carcinog. 13: 14. Chen J.N., D. He, F. Tang and C.K. Shao. 2012. Epstein-Barr virus-associated gastric carcinoma: a newly defined entity. J. Clin. Gastro­enterol. 46(4): 262–271. Czabotar P.E., G. Lessene, A. Strasser and J.M. Adams. 2014. Control of apoptosis by the BCL-2 protein family: implications for physiology and therapy. Nat. Rev. Mol. Cell Biol. 15(1): 49–63. Czopek, J. P., M., Stojak, A., Bińczak, T., Popiela, J., Kulig,Z., Rudzki, and J. Stachura. 2003. EBV-positive gastric carcinomas in Poland. Pol. J. Pathol. 54(2): 123–128. Fu Q., C. He and Z.R. Mao. 2013. Epstein-Barr virus interactions with the Bcl-2 protein family and apoptosis in human tumor cells. J. Zhejiang Univ. Sci. B 14(1): 8–24. Gravalos C. and A. Jimeno. 2008. HER2 in gastric cancer: a new prognostic factor and a novel therapeutic target. Ann. Oncol. 19(9): 1523–1529. Helicobacter and Cancer Collaborative Group. 2001. Gastric can­cer and Helicobacter pylori: a combined analysis of 12 case control studies nested within prospective cohorts. Gut 49(3): 347–353. Iizasa H., A. Nanbo, J. Nishikawa, M. Jinushi and H. Yoshiyama. 2012. Epstein-Barr Virus (EBV)-associated gastric carcinoma. Viruses4(12): 3420–3439. International Agency for Research on Cancer. 1994. Schistosomes, liver flukes and Helicobacter pylori. Evaluation of carcinogenic risks to humans. IARC Monograph Evaluating Carcinogenic Risks to Humans 61: 177–240. Ishii H., G. Gobé, Y. Kawakubo, Y. Sato and Y. Ebihara. 2001. Interrelationship between Epstein-Barr virus infection in gastric carcinomas and the expression of apoptosis-associated proteins. Histopathol. 38(2): 111–119. Ishii H.H., G.C. Gobe, J. Yoneyama, M. Mukaide and Y. Ebihara. 2004. Role of p53, apoptosis, and cell proliferation in early stage Epstein-Barr virus positive and negative gastric carcinomas. J. Clin. Pathol. 57(12): 1306–1311. Izadi M. and S. Taheri. 2010. Significance of in situ hybridization results for EBV-encoded RNA in post-transplantation lymphopro­liferative disorder setting: report from the PTLD. Ann. Transplant. 15(4): 102–109. Konturek P.C., J. Kania, J.W. Konturek, A. Nikiforuk, S.J. Kon­turek and E.G. Hahn. 2003. H. pylori infection, atrophic gastritis, cytokines, gastrin, COX-2, PPAR gamma and impaired apoptosis in gastric carcinogenesis. Med. Sci. Mon. 9(7): SR53–66. Kountouras J., C. Zavos, D. Chatzopoulos and P. Katsinelos. 2008. New aspects of Helicobacter pylori infection involvement in gastric oncogenesis. J. Surg. Res. 146(1): 149–158. Kume T., K. Oshima, T. Shinohara, H. Takeo, Y. Yamashita,T. Shirakusa and M. Kikuchi. 1999. Low rate of apoptosis and over­expression of bcl-2 in Epstein-Barr virus-associated gastric carci­noma. Histopathol. 34(6): 502–509. Kuniyasu H., W. Yasui, H. Yokozaki and E. Tahara. 2000. Helico­bacter pylori infection and carcinogenesis of the stomach. Langen­becks Arch. Surg. 385(2): 69–74. Lee J.Y. and N. Kim. 2015. Diagnosis of Helicobacter pylori by inva­sive test: histology. Ann. Transl. Med. 3(1): 10. Lima V.P., M.A. de Lima, A.R. André, M.V. Ferreira, M.A. Barrosand S.H. Rabenhorst. 2008. H. pylori (CagA) and Epstein-Barr virusinfection in gastric carcinomas: correlation with p53 mutation and c-Myc, Bcl-2 and Bax expression. World J. Gastroenterol. 14(6): 884–891. Lin J.H., C.H. Tsai, J.S. Chu, J.Y. Chen, K. Takada and J.Y. Shew. 2007. Dysregulation of HER2/HER3 signaling axis in Epstein-Barr virus-infected breast carcinoma cells. J. Virol. 81(11): 5705–5713. Matsubara Y., H. Yanai, K. Ishiguro, S. Ryozawa, Y. Okazaki,N. Matsui and K. Okita. 2004. Clinical interpretation of the his­tological typing of gastric cancer using endoscopic forceps biopsy. Hepatogastroenterol. 51(55): 285–288. Matsumoto A., H. Isomoto, M. Nakayama, J. Hisatsune, Y. Nishi,Y. Nakashima, K. Matsushima, H. Kurazono, K. Nakao, T. Hirayama and S. Kohno. 2011. Helicobacter pylori VacA reduces the cellular expression of STAT3 and pro-survival Bcl-2 family pro­teins, Bcl-2 and Bcl-XL, leading to apoptosis in gastric epithelial cells. Dig. Dis. Sci. 56(4): 999–1006. Meng W.D., R.X. Chu, B.Z. Wang, L.P. Wang, L.L. Ma andL.X. Wang. 2013. Helicobacter pylori infection and expressions of apoptosis-related proteins p53, ASPP2 and iASPP in gastric cancer and precancerous lesions. Pathologie Biologie (Paris) 61(5): 199–202. Mérino D. and P. Bouillet. 2009. The Bcl-2 family in autoimmune and degenerative disorders. Apoptosis 14(4): 570–583. Moldoveanu T., A.V. Follis, R.W. Kriwacki and D.R. Green. 2014. Many players in BCL-2 family affairs. Trends Biochem. Sci. 39(3): 101–111. Murray P.G. and L.S. Young. 2002. The role of the Epstein-Barr virus in human disease. Front. Biosci. 7: d519–540. Nasierowska-Guttmejer A., L. Trzeciak, M.P. Nowacki andJ. Ostrowski. 2000. p53 protein accumulation and p53 gene muta­tion in colorectal cancer. Pathol. Oncol. Res. 6(4): 275–279. Niedobitek G. and H. Herbst. 2006. In situ detection of Epstein-Barr virus and phenotype determination of EBV-infected cells. Methods Mol. Biol. 326: 115–137. Oldani A., M. Cormont, V. Hofman, V. Chiozzi, O. Oregioni,A. Canonici, A. Sciullo, P. Sommi, A. Fabbri, V. Ricci and P. Boquet.2009. Helicobacter pylori counteracts the apoptotic action of its VacA toxin by injecting the CagA protein into gastric epithelial cells. PLoS Pathogens 5(10): e1000603. Ozaki T. and A. Nakagawara. 2011. p53: the attractive tumor sup­pressor in the cancer research field. J. Biomed. Biotechnol. 2011: 603925. Palli D., G. Masala, G. Del Giudice, M. Plebani, D. Basso, D. Berti, M.E. Numans, M. Ceroti, P.H. Peeters, H.B. Bueno de Mesquita et al. 2007. CagA+ Helicobacter pylori infection and gastric cancer risk in the EPIC-EURGAST study. Int. J. Cancer 120(4): 859–867. Petit B., K. Leroy, P. Kanavaros, M.L. Boulland, M. Druet-Cabanac, C. Haioun, D. Bordessoule and P. Gaulard. 2001. Expression of p53 protein in T- and natural killer-cell lymphomas is associated with some clinicopathologic entities but rarely related to p53 mutations. Human Pathol. 32(2): 196–204. Shibata A., T.A. Longacre, B. Puligandla, J. Parsonnet andL.A. Habel. 2001. Histological classification of gastric adenocarci­noma for epidemiological research: concordance between pathologists. Cancer Epidemiol. Biomarkers Prev. 10(1): 75–78. Shim J.H., J.H. Yoon, S.S. Choi, H. Ashktorab, D.T. Smoot,K.Y. Song, S.W. Nam, J.Y. Lee, C.H. Park and W.S. Park. 2014. The effect of Helicobacter pylori CagA on the HER-2 copy number and expression in gastric cancer. Gene 546(2): 288–296. Sivachandran N., C.W. Dawson, L.S. Young, F.F. Liu, J. Middel­dorp and L. Frappier. 2012. Contributions of the Epstein-Barr virus EBNA1 protein to gastric carcinoma. J. Virol. 86(1): 60–68. Suriani R., M. Colozza, E. Cardesi, D. Mazzucco, M. Marino,S. Grosso, S. Sanseverinati, I. Venturini, A. Borghi and M.L. Zeneroli. 2008. CagA and VacA Helicobacter pylori antibodies in gastric cancer. Can. J. Gastroenterol. 22(3): 255–258. Szkaradkiewicz A., T.M. Karpiński, M. Drews, M. Borejsza-Wysocki, P. Majewski and E. Andrzejewska. 2010. Natural killer cell cytotoxicity and immunosuppressive cytokines (IL-10, TGF-beta1) in patients with gastric cancer. J. Biomed. Biotechnol. 2010: 901564. Szkaradkiewicz A., W. Majewski, M. Wal, M. Czyzak, P. Majewski, J. Bierła and A. Kuch. 2006. Epstein-Barr virus (EBV) infection and p53 protein expression in gastric carcinoma. Virus Res. 118(1–2): 115–119. Targa A.C., A.C. César, P.M. Cury and A.E. Silva. 2007. Apoptosis in different gastric lesions and gastric cancer: relationship with Helicobacter pylori, overexpression of p53 and aneuploidy. Gen. Mol. Res. 6(3): 554–565. Thompson M.P. and R. Kurzrock. 2004. Epstein-Barr virus and cancer. Clin. Cancer Res. 10(3): 803–821. Vermeulen K., Z.N. Berneman and D.R. Van Bockstaele. 2003. Cell cycle and apoptosis. Cell Prolifer. 36(3): 165–175. Wang Y., B. Luo, L.P. Yan, B.H. Huang and P. Zhao. 2005. Rela­tionship between Epstein-Barr virus-encoded proteins with cell proliferation, apoptosis, and apoptosis-related proteins in gastric carcinoma. World J. Gastroenterol. 11(21): 3234–3239. Wong H.L., X. Wang, R.C. Chang, D.Y. Jin, H. Feng, Q. Wang, K.W. Lo, D. Huang, P.W. Yuen, K. Takada and others. 2005. Stable expression of EBERs in immortalized nasopharyngeal epithelial cells confers resistance to apoptotic stress. Mol. Carcinogenesis 44(2): 92–101. Wu M.S., C.T. Shun, C.C. Wu, T.Y. Hsu, M.T. Lin, M.C. Chang, H.P. Wang and J.T. Lin. 2000. Epstein-Barr virus-associated gastric carcinomas: relation to H. pylori infection and genetic alterations. Gastroenterol. 118(6): 1031–1038. Zimber-Strobl U., B. Kempkes, G. Marschall, R. Zeidler,C. Van Kooten, J. Banchereau, G.W. Bornkamm and W. Ham­merschmidt. 1996. Epstein-Barr virus latent membrane protein (LMP1) is not sufficient to maintain proliferation of B cells but both it and activated CD40 can prolong their survival. EMBO J. 15(24): 7070–7078.